Oh Pole flip! I totally forgot about that! ...didn't Dr.LaViolette say that the G2 cloud could nuke our power-grids in worst case? If it comes too close to earth or the sun or something? Isn't the G2 risk for a natural sunrot? I might be way off here... but at least I remember Dr.LaViolette mentioning about the possibility of our air getting Ionized or something, if the G2 cloud. . . um, something. I really know "nothing". Just puzzlin' . . .
...althou when you say that we created the sun to sustain us, gives me hope. this doesn't sound so nice! How can I fix the Magnetosphere? or anyone for that matter? Earth with a pole flip? This paper by Witzel, et al. describes several new things that were learned from these observations. 1) The G2 cloud definitely contains a star. 2) This star has a luminosity of 20 solar luminosities which implies that it has a mass of about twice the Sun’s mass. 3) They rule out the possibility that the star is a binary star system. 4) They find that the photosphere of the star has a diameter of 2 AU (astronomical units, the size of the Earth’s orbit. This is 100 times larger than the photosphere normally seen for a star of this luminosity, which they find puzzling. But over a year ago, in May 2013, I had predicted that stars at perhaps would have such an inflated size; see below. 5) They more accurately define the pericenter distance for the G2 cloud, determining its distance of closest approach to be 215 ± 30 AU. This is further out than the 144 AU previously estimated by Gillessen, et al. Witzel, et al. also find that at this distance of closest approach a 2 solar mass star within the G2 cloud should have a tidal radius of 1.3 AU. The 1 AU radius estimated for the G2 star’s photosphere is smaller than this tidal radius, which is consistent with the lack of evidence of tidal stripping. Although, the possibility still remains that tidal stripping will be observed at the time the star reaches its periapse distance. Whether it has already passed its orbital pericenter, though, is not known. 6) They conclude that the star will continue to follow its orbital path around the Galactic core and continue on out. In a May 2013 posting, G2 Cloud Predicted to Approach Twice as Close to GC, it was predicted that a star nearing its closest approach to the Galactic core would have a substantially inflated photosphere due to a number of reasons: a) energy added to the star due to tidal interactions with the Galactic core, b) energy added to the star due to cosmic ray heating of its atmosphere by the Galactic core’s cosmic ray flux, and c) internal genic energy production which itself depends on the value of the ambient gravity potential field, this field becoming increasingly negative as the star approaches its pericenter. At that time I estimated that a one solar mass star approaching within 130 AU of the Galactic core would have its luminosity boosted 37 fold to 37 solar luminosities. With the current determination of Witzel, et al. that the star will instead come within 215 AU when at its closest approach to the core, this luminosity estimate must be revised downward. Accordingly, a one solar mass star at a distance of 215 AU from the Galactic core will have a genic energy output reduced to only 60% of what was previously estimated and a cosmic ray heating input reduced to only 36% of what had been previously estimated. As a result a one solar mass star is estimated to have a total luminosity of 18.5 solar luminosities, which is close to what Witzel, et al. report for the G2 cloud star. Here we neglect the contribution to luminosity due to tidal heating effects which would be small by comparison. Previously I had estimated that due to its over luminosity the photosphere of a one solar mass star at pericenter would expand 4 fold to 4 solar radii. I was apparently being too conservative. Because here we see that even with a more modest luminosity increase to 18.5 solar luminosities (half of the earlier estimate) that the star’s photospheric radius expands to 1 AU, 54 fold larger, about like that of a star going through its red giant phase. Consequently, my earlier posting quite accurately estimated the luminosity observed for the G2 cloud star (once the pericenter distance is corrected for), but it underestimated its photospheric diameter. Indeed, my earlier suggestion that the star would attain a diameter of 4 solar radii, was actually just a rough guess. So, in view of the above discussion, the G2 cloud appears to contain a star of about one solar mass which is about 20 fold over luminous due to its passage close to the Galactic core, this excess luminosity causing its photosphere to expand approximately 200 fold to a radius of 1 AU. It is unlikely that a binary star is present, but the star’s association with a jovian sized planet cannot be ruled out. One criticism I have of the report by Witzel, et al. is that they still use the term “black hole” to refer to the galactic core. The black hole theory is dead now; see recent posting. Let’s put flowers on its grave. When referring to this supermassive celestial object, astronomers should now use the term I have been proposing for the past 30 years: “Mother star”, or supermassive galactic core. I appreciate that he shares his findings with everyone, even though not everyone will understand his perspective, and many disagree with him ... I don't believe that his theories are inspired by ego . I have come to trust his ability to discern heavenly events with enough accuracy that he can be Independent of the Scientific Community's influence ... and I believe that his concern for his fellow man is genuine and not self serving - he SHARES what he finds freely and is not bound by the Secret Government's/Private Sector's oaths to with-hold information from the public ... I respect his Independence and ability to self-correct his theories as the evidence becomes available ... I believe that because he is independent, that he has been able to advance OUR knowledge beyond the limitation of that Heirarchy, established by Anu. in a nutshell, I believe that the Earth is just as capable of healing itself, as we are ... once we are aware of its/our Nature (origins and destiny). here is something I thought was worth sharing, that someone contributed to another forum under the topic "sun gazing"
I've sun gazed for 30 plus years and don't wear glasses, don't need them and have perfect vision in my mid 50s. The rules are simple ladies and gentleman. I have not been sick a day in my life since starting this discipline. I do everything you should not do. Yet my health even in my mid fifties is excellent. At times during certain times of the year it is harder to see the sun each day. So, mostly its a discipline filled with some let down if you enjoy it such as I do but you get used to the ups and downs of nature here. Even when forced to miss the sun due to family and other issues of time changes travel and more you gain benefit from communing as described each chance you can, and particularly when you feel ill! I can still jump up and grab the rim of a ten foot basket just as I did in my 20s. I will be 55 soon. I have friends I graduated with 6'8" that can't do that! I'm 6'3" in my shoes. I can still squat, kneel, run, and have no other issues of health like my family. I have all my teeth! All my siblings are younger than me but all are pill popping and ill. Their children are ill. If you suffer like this, then you most of all should pay close attention to what I am saying now. If you want to be well, introduce yourself to the sun tomorrow morning and begin a ritual of doing that everyday. Arthritis? Aches, headaches, joint and nausea? Try communing with the sun! You can chant, sing along to songs you listen to or just stand there watching. Find an equal viewing area for the set. Watch the sun for 10 minutes through the trees waiting for the burning bush effect.. When this happens you too will not need to be told. You will not need me to define it, or describe it, you will not need help finding it or feeling it or to ask what is that? I assure you it will come and you too will be overwhelmed, changed and when you are finished and find your body and mind health is now much different, much better, your pain gone, you are going to be so happy! 1)Introduce yourself. Realize the sun is alive. It is a consciousness as you will soon realize also if you begin this practice. 2)As my teacher said, you can only see the face of God when his face is red or orange. You only look at the sun within the first hour of sun rise or within the hour of sun set! To look beyond this will hurt your eyes and God rejects you. Do no try it past that time. Only within the hour. I made a habit of the first fifteen minutes of sun rise and roughly the last half hour of sun set. Sometimes if it seemed brighter due to cloud haze and other issues you have to stop early while at other times the stays orange a long time and you can look for quite a few seconds more than usual. You can start by looking directly at the sun and my teacher said we all should at times, but it is not necessary. It should not be always be the same place or angle and you should prepare for travel by keeping and eye out where you can catch it from new locations.. Follow the sun. At times it will seem that it is avoiding you. Some would argue it does. 3)Stand in your bare feet whenever possible. When this is not possible hold a tree branch or plant to ground to mother earth during your viewing. This combined with the sun gazing do tremendous things to the body. All good I assure you and you will certainly feel it if you do this. Vocal work seems to add to this if its emotional. Listening to music and singing along is a great way to release also. 4)Listen to the sun. Let it guide you. My mentor was a man of few words. His teaching were to listen to the sun and let it tell you when you do each type of gaze. At some times the position of the sun coming up or going down will be more favorable for the burning bush technique of gazing. At other times the sun will be open and very much away from any such plants and you will be able to view the sun fully as it rises or sets. In this same way let the sun tell you how long you can look comfortably. If gazing directly gets scary or you feel a push back stare above it into the other shades or duck behind tree leaves to refract it out and change the frequency, but so long as the sun is red or orange and so long as any hint of orange is available you are safe. Once yellow creeps in stop gazing. With the tree leaves viewing or burning bush technique it is often possible to use the trees to refract the light into many shades with one primarily showing at the core. So long as the sun refraction shows plenty of green in the outer areas you are safe and can look on with joy, tears and all if they come for you. Spend as much time as possible in the center, and don't forget to blink. For me this is more than just a simple ritual. It has become something I relish, something I look forward to and cannot wait to do again and even somewhat of a need! The sun can heal you. The sun can awaken you. The sun can free you and come right into you and engulf you! I've been so engulfed on a few occasions as to have trouble discerning myself from the light! This has even happened quite profoundly with eyes closed communing with the sun for me! I could almost see and feel what Moses must have seen and felt. The rules are simple so follow them to the letter. Be safe. I've done this for years. My eyes are perfect. I don't wear glasses and don't need them. Do not look at the sun through glass. Take your glasses off. It is always best in bare feet. If not possible ground yourself at least. Believe me all the great gurus of the past were doing this. Jesus was brought up in a sun gazing sect of the Essenes. Moses' burning bush was nothing other than the same. You can now experience exactly what he did and you too will be changed by it just as Paul was when he did it at the wrong time and it blinded him! You must abide by the rules. Follow them and you will become light! Shine that light, recharge it often and the time is now to share. Many gazers, okay well, some also squint with eyes fully closed if they are not allowed by nature to see the sun rise or if it appears that nature will deny the sun set. So at times during the day if the sun does show when you miss the sun rise or the set is in question you can get some benefit by the 'squint' technique to change frequency of the light using your eye lids. This technique according to my Zuni elder teacher is why so many names like Fools Crow, Crows Feet and so on, all exist in Native culture. They were sun gazers also squinting at the sun often during the day as well as watching the rise and set. In each case these men lived to be very great ages and were considered very wise by their people. While you will most surely get crows feet from the practice of squinting it can allow one much in the way of color and light play that is quite refreshing. Prepare yourselves. If you do this, even with eyes closed and commune with the sun the sun will surprise you if you do it with the same reverence as your ancestors did to greet the sun each day. In time after getting familiar you will see as I did and others did that nature at times say no. There will be times when you cannot see the sun rise or set. This can be due to cloud cover, atmospheric conditions that make the sun yellow from the start, or from things within your own life that prevent it. Go with it when this comes. It happens. Absorb and be thankful that you do get to enjoy what you do get. Take each day for the gifts it gives. Some sun rises and sun sets will be much more stunning and enjoyable than others. Each will have its own unique addition to the whole tho and each gaze, even if brief sparks that light within you to shine just a little brighter when you recognize it each day. Lastly if you are not comfortable staring directly at the sun much benefit can be had from eyes closed and using trees, leaves and your eye lids to change the frequency and color. No one is forcing you to start staring at it if you have doubts or believe optometrists. By the way the person that invented the spectacle has a big apology for his crime to humanity for that on his tombstone! He discovered before dying they did more harm than good and tried to tell everyone but...too late! IN their search for what fuels our Star, Scientists have discovered Neutrinos (from ET origins) ... here is a picture of neutrinos aka "highest energy" ever observed ... wonder if this is what animates Life ... they say "it" comes in all shapes and "flavors" here we see it "morphing from one hue to the next ... could this be the "cosmic energy" that James told us about - is this "Love" the most powerful force in the Universe? For decades, scientists have been searching for ghostly neutrino particles from outer space, and now they have finally found them. Using the IceCube Neutrino Observatory in Antarctica, researchers found the first evidence of neutrinos from outside the solar system since 1987. The findings open the door for a new era of astronomy that could reveal secrets of the strangest phenomena in the universe, scientists say. For the past century, scientists have pondered the source of cosmic rays, which contain the energy of a rifle bullet in a single atomic nucleus. It's thought that objects such as supernovas, black holes or gamma ray bursts may produce cosmic rays, but their origin is difficult to detect. Instead, scientists look for neutrinos — subatomic particles with no charge and very little mass — produced when cosmic rays interact with their surroundings. Billions of neutrinos pass through a square centimeter of Earth every second, and only a tiny fraction of them interact with matter. But in April 2012, IceCube detected two neutrino events with energies above 1 petaelectronvolt (PeV), the first definitively detected neutrinos from outside the solar system since 1987, during a supernova in the Large Magellanic Cloud. The new events, which scientists nicknamed "Bert" and "Ernie" (after the Sesame Street characters), were more than 1 million times the energies of the ones observed in 1987. Deeper analysis revealed 28 high-energy neutrinos in IceCube data taken from May 2010 to May 2012. Each event was greater than 30 teraelectronvolts (TeV). The group reported preliminary results May 15 at the IceCube Particle Astrophysics Symposium at UW–Madison, and the full results were detailed online today (Nov. 21) in the journal Science. "We have some really compelling evidence that we have neutrinos from beyond Earth's atmosphere and beyond the solar system," said study co-author Nathan Whitehorn, a physicist at the University of Wisconsin-Madison. The number of events is too small to pinpoint the origin of the neutrinos, however. The next step will be answering questions such as where the neutrinos come from, what their energies are and what "flavor" they are (neutrinos come in three types). As IceCube gathers more data, " All of these questions are now starting to be addressed," Katz said. Thanks for sharing that post about the Sun gazing Starduster - it was awesome! I think I would like to try that. How's your head injury by the way? Are you better now? It's not the earth we need be concerned about so much as us being aware of what we are essentially and acting from that instead of so unconsciously. The earth made her transition already, we don't heal her we need to heal ourselves.. It's us with all the tools given us in awareness and collectively that synchronize as the Species of the Planet for the Grand Portal discovery and being able to meet and work with our Galactic brothers and sisters. How awesome is that??!!! It's planetary and earth is already there. Planetary Alignment On Jan 4, 2015 Will Decrease Gravity For 5 Minutes Causing Partial Weightlessness. Strange natural occurrences are happening in the world today. But nothing more magnificent than the one you will experience on January 4, 2015. According to British astronomer Patrick Moore, at exactly 9:47 PST AM on January 4th, Pluto will pass directly behind Jupiter, in relation to Earth. This rare alignment will mean that the combined gravitational force of the two planets would exert a stronger tidal pull, temporarily counteracting the Earth’s own gravity and making people virtually weightless. Moore calls this the Jovian-Plutonian Gravitational Effect. Moore told scientists that they could experience the phenomenon by jumping in the air at the precise moment the alignment occurred. If they do so, he promised, they would experience a strange floating sensation. Astronomers have long been aware that there would be an alignment of the planets on that date, when Mercury, Venus, Earth, Mars, Jupiter, Saturn, Uranus, Neptune and Pluto would be on the same side of the sun, within an arc 95° wide. But now they are guaranteeing the occurrence as the gravitational effect of the other planets on the Earth’s crust is maximum even at their closest approach. But don’t get too excited. If you think you’ll be able to float around your house, you’re wrong. But, if you jump in the air at 9:47 AM PST, on January 4, 2015, it should take you about 3 seconds to land back on your feet instead of the usual 0.2 seconds. So, mark this date on your calendar and share it with your friends! Zero gravity day is just around the corner! OK .. this has got to be the strangest thing I have ever seen, happening to the sun (yesterday) - it looks like lightening - but can you imagine how huge it must be ??? ... is this "sun rot"? Last edited by starduster on Wed Jan 07, 2015 3:36 pm, edited 1 time in total. BRIGHTENING, GORGEOUS COMET: Comet Lovejoy (C/2014 Q2) continues to brighten, and it can now be seen with the naked eye even from light-polluted urban areas. Science journalist and longtime comet watcher Mariano Ribas reports from the Planetario de Buenos Aires: "Last night, I could see Comet Lovejoy with my unaided eyes in the sky of Buenos Aires. Barely, and only using averted vision. But I saw it!" "Comparing the comet to nearby background stars, I estimate the comet's visual magnitude to be about 4.2," he continues. "The comet was very bright with my 10x50 binoculars. Also, I could see a hint of its tail. The comet's atmosphere (or 'coma') looks clearly gray/green, and it appears more condensed than one week ago." 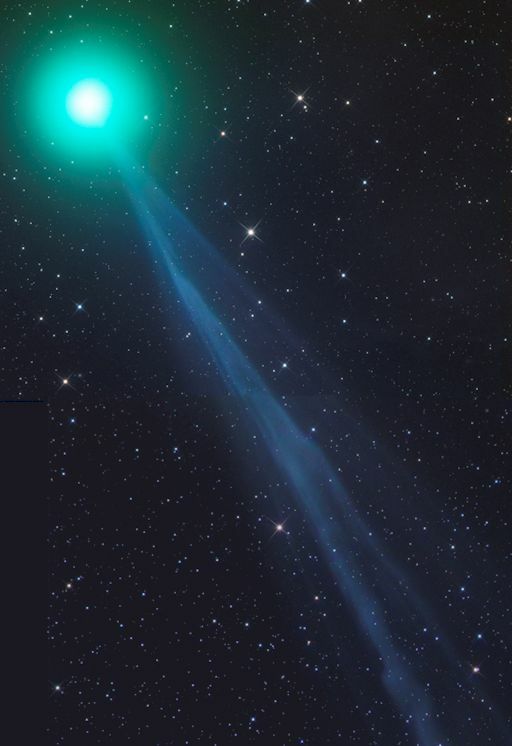 The comet's blue tail is so long, only 1/3rd of it fits in the space provided above. The whole thing stretches more than 7 million km from end to end. On Jan. 7th, Comet Lovejoy was at its closest to Earth: 0.47 astronomical units (70 million km) away. Although the comet will be moving away from us for the rest of the month, it will continue to grow in brightness because it is still moving closer to the sun. "Surely," says Ribas, "the best is still to come!" This week, observers can find Comet Lovejoy passing by the constellation Orion en route to Taurus. For accurate pointing of telescopes, an ephemeris from the Minor Planet Center is available. An unsettling report prepared by the Aerospace Defence Forces (ADF) that is circulating in the Kremlin today appears to show that many scientists are in fear of the potential effects to our solar system of what they term is an “asteroid army” of at least 83 giant space objects due to hurtle past Earth and Mars over the next three months. According to this report, these giant asteroids appear to have an “intelligent trajectory” not unlike a military formation and is comprised of three waves with 43 of them flying close to Earth in January, 25 in February, and 15 in March. Raising the concerns of these scientists about these giant asteroids, this report continues, was their appearing to slightly alter their orbits this past week in a manner similar to that of the long-period Comet C/2014 Q2 (Lovejoy) [photo 3rd left] which has brightened to such an extent it is now visible to the naked-eye as it approaches its rendezvous with the celestial equator from the south on 9 January. Of the immediate “effect/effects” of Comet Lovejoy and these giant asteroids altering their course this past week, ADF experts in this report say, was the sudden opening on the Sun’s south pole of a massive coronal hole, while at the exact same time the equally massive sunspot AR2253 erupted and has a 'beta-gamma-delta' magnetic field that harbors energy for X-class solar flares…and all occurring in a Solar Cycle that has had the highest daily sunspot numbers of any year since 2002. Where Western scientists are keeping their citizens attention focused on the potentiality of any of these giant asteroids actually striking our Earth, this report further states, the true danger that exists for our planet is a full-scale electromagnetic pulse (EMP) such as occurred on 19 October on Mars due to the passing of passing of Comet Siding Spring (C/2013 A1) when a still as yet unexplained 228 million kilometer (142 million mile) “plasma/electrical discharge” between the Sun and Mars occurred and which was captured on video. Equally as grave of a threat, this report continues, are the effects Comet Lovejoy and this “asteroid army” could have on the potentially catastrophic North American Magnetic Anomaly (first reported on 13 June of last year) and which within 48 hours of their “orbit alteration” began to show serious signs of stress including yesterdays 4.9 magnitude earthquake in Idaho and the 4.2 and 3.0 magnitude earthquakes in Southern California. Interesting to note in this report too is it stating that President Obama’s 17 December lifting restrictions/sanctions of Cuba was directly related to the nearly 5,000 military troops under the command of the Emergency Situations Ministry (EMERCOM) that were rushed to that Caribbean island nation this past July after Alaska had been hit with a rare 6.0 magnitude supersonic earthquake, thus making them available to be deployed upon American soil when/if a catastrophe strikes. Most mysterious in this report, however, are the exact mechanisms being relied upon by ADF scientists in coming to the conclusions they have, but seemingly allude to the “artifact” rushed to the International Space Station this past October in what was described as the most historic rocket launches in Russian-US history. Important to note, though not contained in this report, are that Russian scientists, unlike their Western counterparts, adhere to the findings and principles of what is called the Electric Universe Theory, which basically postulates that electricity plays a more important role in the Universe, than is generally accepted. This theory was greatly expanded upon by the great-Russian historian/researcher Immanuel Velikovsky (1895-1979), who in his 1950 book “Worlds in Collision”, warned of the past fears of our planets earliest peoples regarding celestial happenings such as are occurring now with Comet Lovejoy and this fast approaching “asteroid army”. Velikovsky proposed, it’s important to remember, that around the 15th century BCE, Venus was ejected from Jupiter as a comet or comet-like object, and passed near Earth (an actual collision is not mentioned). The object changed Earth's orbit and axial inclination, causing innumerable catastrophes which were mentioned in early mythologies and religions around the world. Fifty-two years later, it passed close by again, stopping the Earth's rotation for a while and causing more catastrophes. Then, in the 8th and 7th centuries BCE, Mars (itself displaced by Venus) made close approaches to the Earth; this incident caused a new round of disturbances and disasters. After that, the current “celestial order” was established. The courses of the planets stabilized over the centuries and Venus gradually became a “normal” planet. And as to if this ADF report is suggesting such a reoccurrence of this kind of “celestial war”, as the ancients described it, is ready to occur to again it is not clear. But neither can it be dismissed out of hand either. January 5, 2015 © EU and US all rights reserved. Permission to use this report in its entirety is granted under the condition it is linked back to its original source at WhatDoesItMean.Com. Freebase content licensed under CC-BY and GFDL. 400,000 Mile Long "Solar Filament" Grows to 1,000,000 KM is Earth-Facing! It took over 30 years to confirm a key thesis of the galactic superwave theory, but now incontrovertible evidence has been found. Observations of the active galaxy PDS 456 made with NASA’s NuSTAR space telescope (Nuclear Spectroscopic Telescope Array), in operation since June 2012, and with the European Space Agency’s XMM-Newton space telescope, now show the presence of an extremely high velocity wind moving outward isotropically away from the galaxy’s center in all directions at up to 30% of the speed of light. Prior to this astronomers had assumed that the winds produced by active galactic cores issued primarily from their poles in the form of jets. PDS 456 is an active galaxy over 2 billion light years away (z = 0.18) whose core is going through a quasar phase emitting radiation at the rate of ~1047 ergs per second, a rate about 100 trillion times greater than our own galactic core. Using these new telescopes, astronomers were able to spectroscopically detect the emission and absorption features of high velocity iron atoms streaming away from its Galactic center along with other ionized gas. 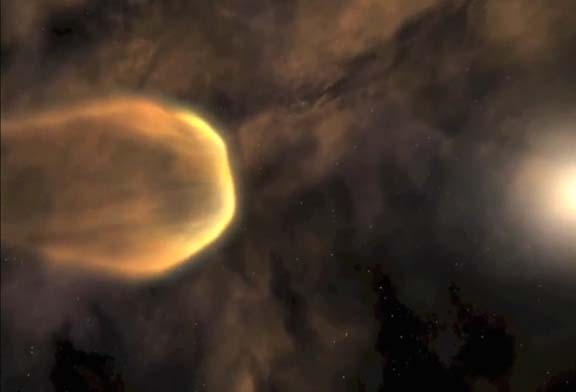 They discovered that these spectroscopic features matched what astronomers call a P Cygni profile, a spectroscopic blueshift/redshift signature produced by ionized gas streaming outwards in all directions in the form of a sphere or spherical shell. They observed the wind at around 700 AU from the Galactic core (~700 times the Sun-to-Earth distance) and observed that it spread outward over a solid angle of at least 2π, hence over at least half of the surface of the sphere, with the implication that it actually blew outward in all directions. Quite likely they will be finding similar spherical wind outflows in other galaxies as well. This finding challenges the conventional view that these supermassive black holes are cores energized by in falling material. Because this group acknowledges that with a wind as strong as they are seeing (1046 erg/second) it would be impossible for material to fall into the core to fuel its observed emission. 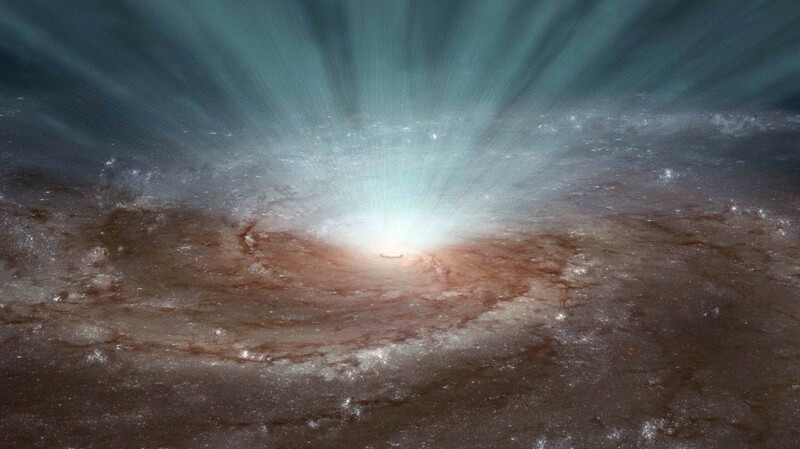 Black hole theorists side step this by suggesting that the “black hole’s” activity was fired up at an earlier date when such a wind was absent and that now the presence of this wind will have a limiting effect to cause the black hole’s activity to shut off. Such reasoning, in my opinion, is pure fantasy. The high velocity wind is there because the core is active, and the core is active not because material is falling into it, but because of its intrinsic energy production through spontaneous energy creation, the phenomenon of genic energy production predicted by subquantum kinetics and proven by numerous a posteriori observations. These recent findings support the subquantum kinetics cosmology which has long proposed that most of the stars in galaxies are formed by matter expelled outward from a galaxy’s core and that is why dwarf elliptical galaxies eventually adopt a spiral shape and then progressively grow in size. These findings then support the subquantum kinetics view of why there is a close correspondence between the mass of a galaxy’s core (Mother star) and its total mass. Another thing that comes from these findings is the realization that a galactic core explosion can have a direct effect on the billions of stars populating a galaxy’s disc. It is but a small step to conclude from these observations of a galaxy 2 billion light years away, that the same occurs within our own Galaxy. That the core causes fierce winds to blow outward also through the disc of the Milky Way. Moreover it is but another small step to realize that these winds seen in PDS 456 are driven by radially propagating cosmic rays; i.e., a superwave, that spread out in all directions like this ionized iron wind, and that similar cosmic ray volleys have passed through our own galactic disc as well as through our Solar System.